Black Friday is just two days away and we’ve started seeing advertisements for all the amazing deals that will be available on said day. 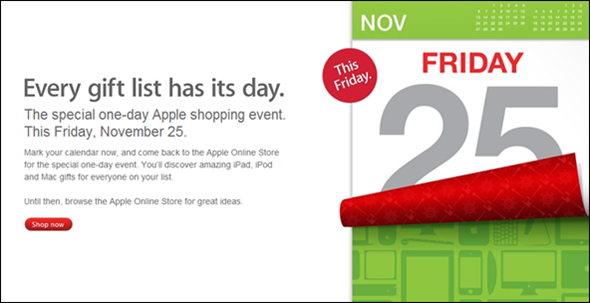 Apple too announced that the company will be hosting a special one-day shopping event on Friday, November 25th (i.e. Black Friday) with discounts on the iPad, iPod and Mac series of products. Today, we came across leaked details of the discounts. Check them out after the jump! 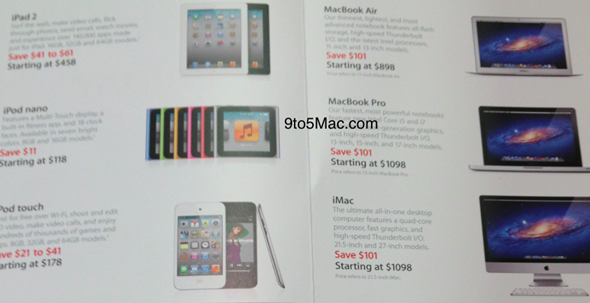 Details of the discounts come from our friends over at 9to5Mac – a blog dedicated to covering all things Apple – in the form of a post in which they discuss the discounts sourced from a “trusted tipster” who sent two photographs of the list of discounted items. 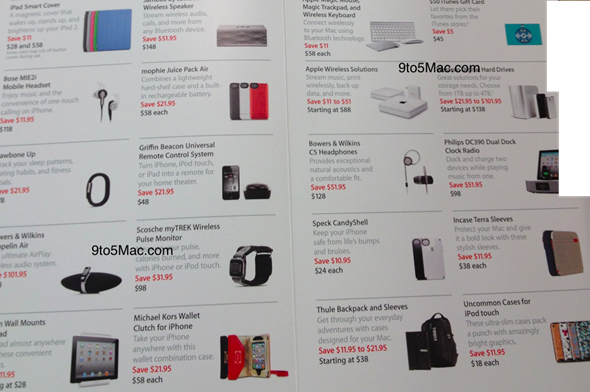 There really isn’t much different between 2010 and 2011’s Apple product discounts. The iPad 2 will get $41-$61 discounts (based on capacity: 16GB, 32GB and 64GB), iPod touch models get a $21-$41 discount (once again, based on capacity), iPod nano models get a miniscule $11 discount while the MacBook Air, MacBook Pro and iMac all get $101 discounts. A trusted tipster has provided us with the details on Apple’s Black Friday (November 25th) 2011 sale. The sale is very similar to Apple’s offerings in past years, but does give better discounts to higher capacities of the iPads and iPods. The deals on the Mac end cover the iMac, MacBook Air, and MacBook Pro, while the iPod nano and iPod touch are the discounted iPod offerings. Accessories are also on sale this year. The popular iPad 2 Smart Covers, Wireless Keyboard and Wireless Magic Trackpad all get $11 off regular price. Other less popular accessories like the AirPort Express, AirPort Extreme and Time Capsule also get discounts, along with some iPhone 4/4S cases and third party products like the JawBone Up, JawBone Jambox and Griffin Universal Remote Control. These discounts really are minute compared to what other consumer electronics manufacturer’s offer on Black Friday. I’m not surprised, though: this is Apple, a company which charges a rather heavy premium for its products (especially for Macs). We should we happy for getting any discount at all, really. If you wish to avail these discounts on your next Apple product purchase, you should visit your local Apple Retail Store.